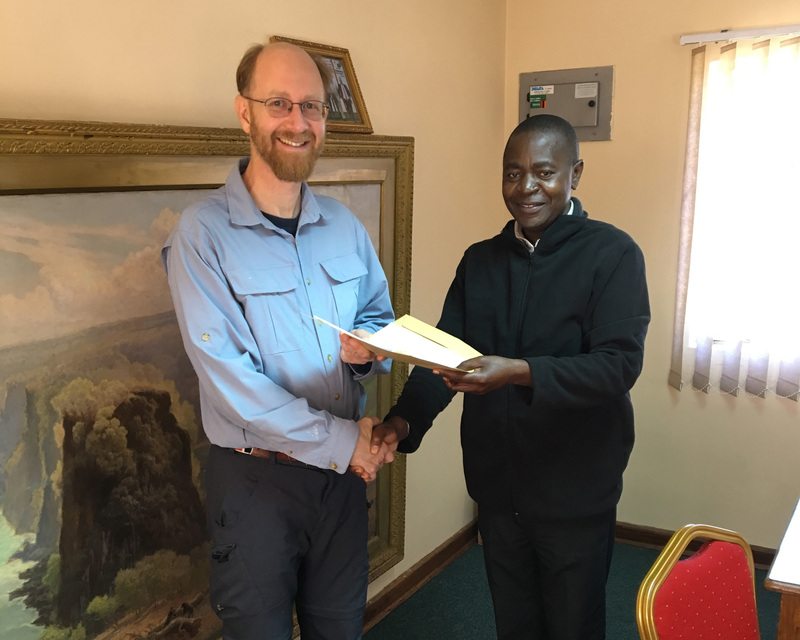 In mid-July 2018, Livingstone Online director, Adrian S. Wisnicki, and project scholar and lead contact for southern African research, Jared McDonald, visited the Livingstone Museum in Livingstone, Zambia to continue building upon the partnership that was initiated in January 2016. An ENHANCE grant from Wisnicki’s home institution, the University of Nebraska-Lincoln, and the generous support of Zimbabwe’s Jafuta Foundation and its trustee, Gail van Jaarsveldt, made the visit possible. The partnership with the Livingstone Museum represents a new and significant phase in Livingstone Online’s collaborations with repositories in southern Africa and follows on from the successful completion of the critical edition of Livingstone’s Manuscripts in South Africa, published by Livingstone Online in February 2018. The trip marked Wisnicki’s first to the Livingstone Museum, while McDonald had visited the Museum on two previous occasions. Staff of the Livingstone Museum (LM) meets with Livingstone Online (LO) representatives for initial discussions at the Museum. The individuals pictured (left to right) are: Fred Nyambe (Registrar of Collections, LM), Terry Nyambe (Assistant Keeper of Ichthyology, LM), Chiku I Nkhoma (Assistant Keeper of History, LM), Adrian S. Wisnicki (Director, LO), Jared McDonald (Project Scholar, LO), George Mudenda (Director, LM), Clare Mateke (Keeper of Mammalogy, LM), and Naomi Nyangu (Accountant, LM). Copyright Adrian S. Wisnicki. CC BY-NC 3.0. McDonald and Wisnicki departed from Johannesburg, South Africa on 9 July, then spent a week in Victoria Falls, Zimbabwe, where the Jafuta Foundation resides, from where they made day trips to Livingstone, Zambia, home of the Museum. The Livingstone Museum houses one of the largest single collections of original Livingstone manuscripts in Africa. The Museum also has numerous Livingstone artefacts in its holdings. The Jafuta Foundation is a non-profit organization that promotes local cultural, educational, and conversation initiatives and has become an integral part of the partnership between the Livingstone Museum and Livingstone Online. The week’s activities commenced with a series of meetings with the director of the Livingstone Museum, George Mudenda, as well as other key members of the Museum’s staff and collaborative team. These meetings provided a valuable opportunity for the Livingstone Online team members to engage with Museum staff over a series of days, discuss a potential grant-funded project, learn about the Museum’s history and holdings, and view key items from the Museum’s Livingstone collection. 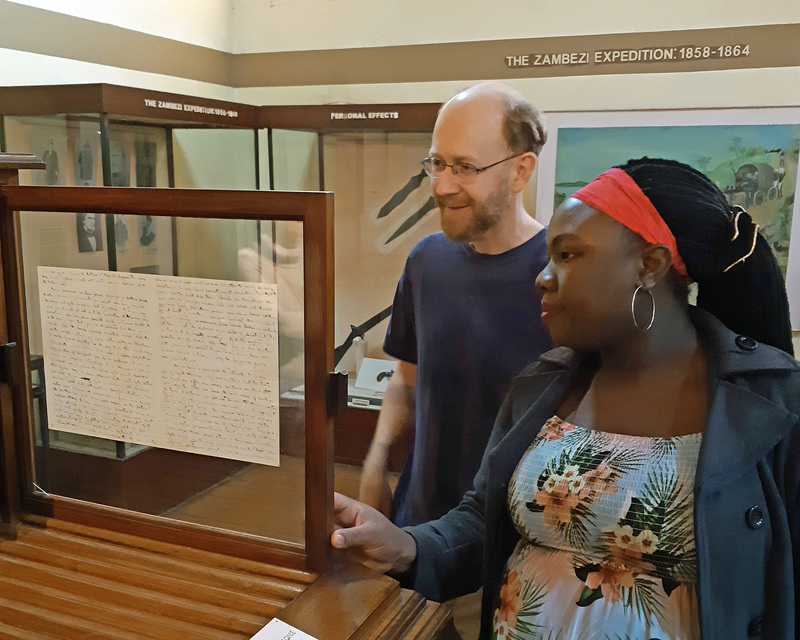 Adrian S. Wisnicki and Chiku I Nkhoma view a David Livingstone manuscript on display at the Livingstone Museum, Zambia. Copyright Jared McDonald. CC BY-NC 3.0. Terry Nyambe and Jared McDonald in discussion during a tour of the Livingstone Museum. In the background (left to right) are Chiku I Nkhoma, Adrian S. Wisnicki, Gail van Jaarsveldt, and Clare Mateke. Copyright Fred Nyambe. CC BY-NC 3.0. The meetings culminated in the signing of a Memorandum of Understanding (MoU) between the Livingstone Museum, Livingstone Online, and the Jafuta Foundation. This non-binding agreement confirms that the entities have agreed to make a collaborative grant application and sets out some of the key workflows that will be central to the application and subsequent digitization and publication project. The agreement took two and a half years to complete and is a robust consensus document. The agreement is of particular significance because it records a series of shared and mutually-agreed project objectives, while its careful development ensured that both sides had multiple opportunities to review, reflect on, and revise all provisions. It is anticipated that a formal application to a funding agency will be made within the coming year. Adrian S. Wisnicki (Director, Livingstone Online) and George Mudenda (Director, Livingstone Museum) conclude the signing of the Memorandum of Understanding between Livingstone Online and the Livingstone Museum. The MoU commits neither side to anything, but rather documents the outcome of a careful process of discussion and consensus building around a shared digitization project that would bring a range of new documents to Livingstone Online, while contributing to the development of the security and storage infrastructure at the Livingstone Museum. Copyright Adrian S. Wisnicki. CC BY-NC 3.0. In addition to the time spent visiting with the Livingstone Museum’s director and staff, Wisnicki and McDonald used part of the week to make short trips to some of Zambia and Zimbabwe’s local sites of historical significance, especially those related to David Livingstone. On 12 July, Wisnicki and McDonald spent the night camping on Nampene Island, located in the Zambezi River upstream from Victoria Falls. Livingstone makes mention of the island in his diaries and in Missionary Travels and Researches in South Africa (1857). He may have camped on the island in the days before he first sighted Victoria Falls in November 1855. 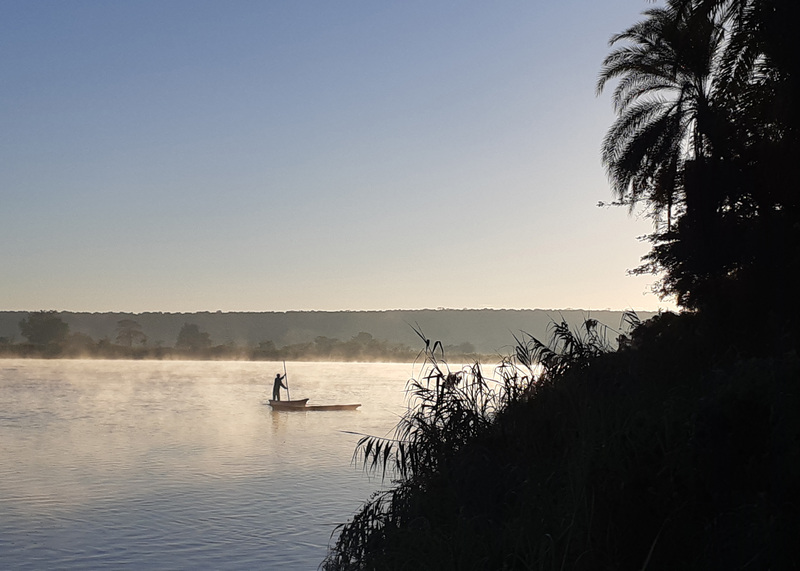 Wisnicki and McDonald had opportunity to meet some of the individuals engaged to work on the island and to witness life on the Zambezi River, in particular, to see the integral role the river’s ecosystem plays in supporting local livelihoods. Through discussions with their host Yakov Sabag, who currently has a concession from Zambia’s government to build a lodge on the island, Wisnicki and McDonald also learned about the former’s efforts to support the local community through specific initiatives on the island. Cuba Kalumba, a Zambian engaged by his long-time friend Yakov Sabag to assist in the development of Nampene Island, retrieves an empty makoro found floating in the Zambezi River one morning. Residents in the vicinity of the river use such boats for transportation. An abandoned one, as here at right, can be a sign of trouble. Indeed, the one that Kalumba collected bore signs of a hippo attack, although the evidence of the makoro itself made it impossible to ascertain whether anyone was hurt in the attack, when the attack occurred, or where on the river it might have happened. Copyright Jared McDonald. CC BY-NC 3.0. 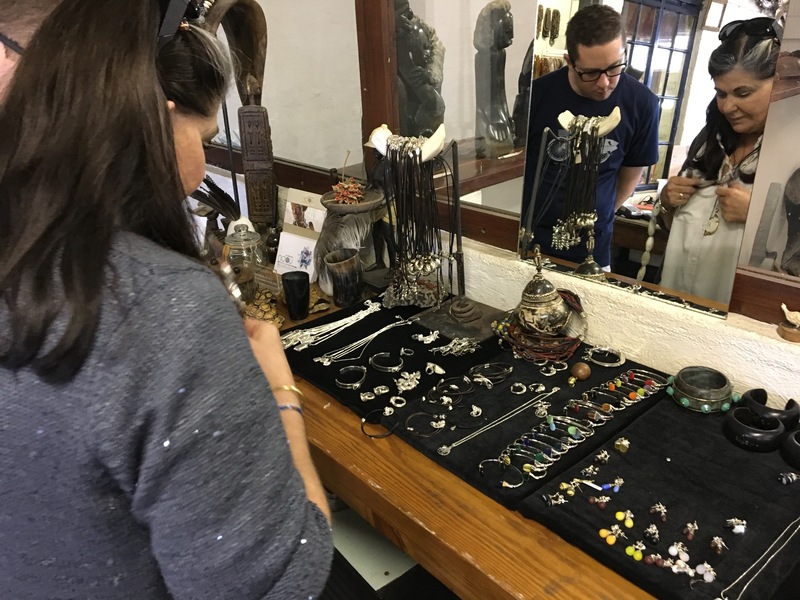 Jared McDonald and Gail van Jaarsveldt review jewelry in the latter’s workshop in Victoria Falls, Zimbabwe. When not engaged in running the Jafuta Foundation, van Jaarsveldt works towards developing her line of African jewelry, the Ndau Collection. Copyright Adrian S. Wisnicki. CC BY-NC 3.0. While in Zimbabwe, McDonald and Wisnicki were hosted by Gail van Jaarsveldt, trustee of the Jafuta Foundation. Van Jaarsveldt first approached Livingstone Online a few years ago regarding some Livingstone memorabilia in her possession. Initial emails led to a long discussion and ultimately resulted in Van Jaarsveldt sponsoring two prior visits from McDonald (in January 2016 and May 2017) plus serving as host for the present visit. As part of her hosting, Van Jaarsveldt coordinated all trip logistics in Zimbabwe and Zambia and organized tours for McDonald and Wisnicki of local historical sites. During the drafting of the MoU with the Livingstone Museum (see above), van Jaarsveldt generously pledged that the Jafuta Foundation would cover a portion of the project costs as an in-kind contribution. During the week in Zimbabwe and Zambia, Wisnicki and McDonald also had the chance to meet Victoria Falls local and longstanding friend of Livingstone Online, Chris Worden. As a raconteur for Victoria Falls Heritage Tours, Worden presents lectures on the life and times of David Livingstone to tourists from around the world. Worden’s lectures are particularly notable because of the emphasis he places on the many African individuals who played a role in Livingstone’s travels, but who are often excluded from retellings of his life story. 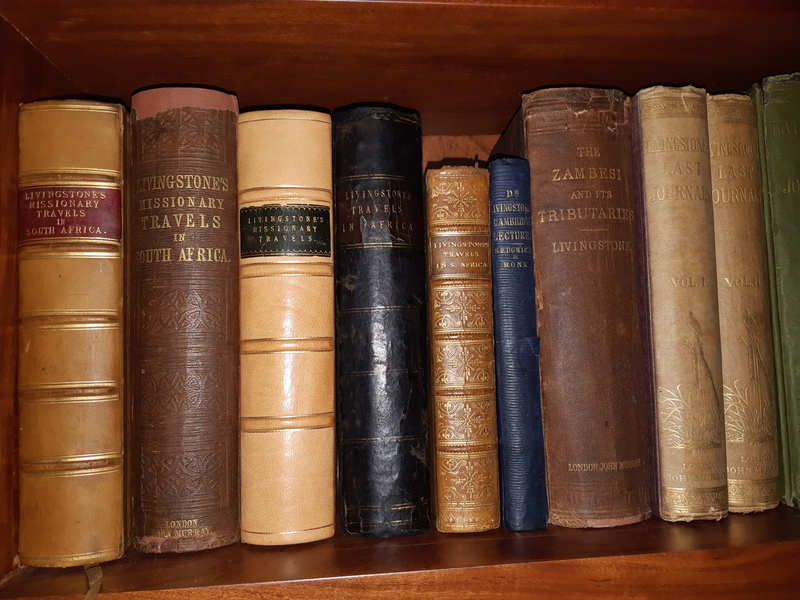 Chris Worden’s collection of original David Livingstone editions. The texts in this image encompass original copies of every major work published by David Livingstone during his lifetime and directly afterwards and include a true rarity – an inscribed first edition of Missionary Travels, Livingstone’s first book. Worden has freely shared images of portions of these edition with Livingstone Online (including relevant pages from the inscribed copy of Missionary Travels), thereby helping to expand the site’s digital collection. Copyright Jared McDonald. CC BY-NC 3.0. 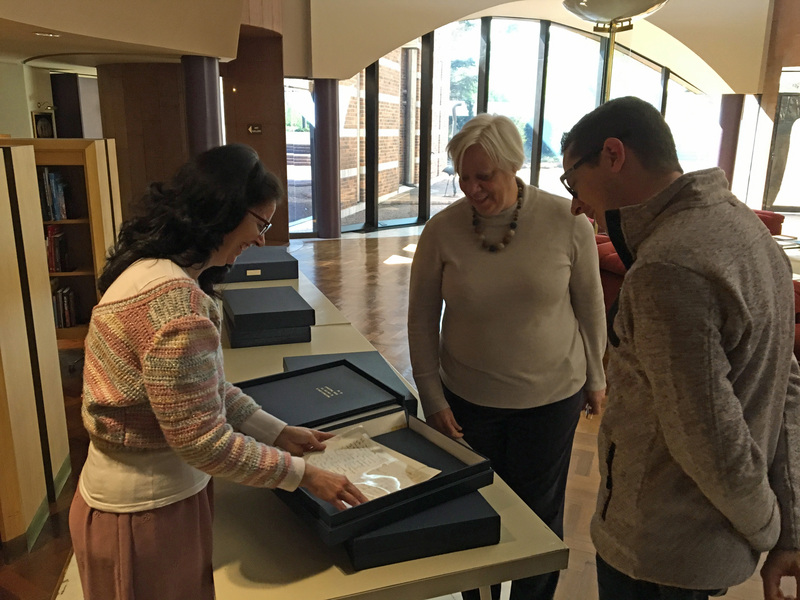 Jennifer Kimble (Head of Manuscripts, Brenthurst Library), Sally Macroberts (Director, Brenthurst Library), and Jared McDonald view a sample of the Brenthurst Library’s original David Livingstone manuscripts. Copyright Adrian S. Wisnicki. CC BY-NC 3.0. Following their return to Johannesburg on 15 July, Wisnicki and McDonald visited the Brenthurst Library, which collaborated with Livingstone Online on Livingstone’s Manuscripts in South Africa. There they met with the Library’s director, Sally Macroberts, and head of manuscripts, Jennifer Kimble. The visit provided a chance to thank the Library for its ongoing support of Livingstone Online and to view the Library’s impressive collections, including its sizeable array of original Livingstone materials. Thereafter, Wisnicki and McDonald were also able to visit the Historical Papers Research Archive at the University of the Witwatersrand. The archive houses several original Livingstone manuscripts. The resident archivists, Garbiele Mohale and Zofia Sulej, were interested to learn more about the work of Livingstone Online and the prospect of a future partnership. Discussions are now underway regarding the possibility of adding the archive’s Livingstone manuscripts and other related items to a second edition of Livingstone’s Manuscripts in South Africa. 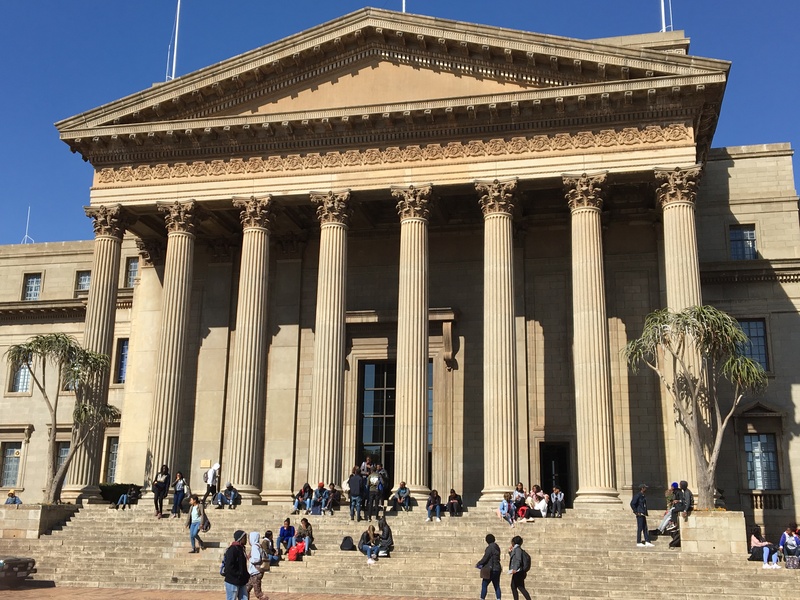 Students gather on the steps of the Great Hall on the Braamfontein Campus of the University of the Witwatersrand, Johannesburg. The university’s William Cullen Library holds one of the more David Livingstone manuscript collections in South Africa. Copyright Adrian S. Wisnicki. CC BY-NC 3.0. The travels of the Livingstone Online representatives in South Africa, Zambia, and Zimbabwe thus built on and extended the team’s growing interest in collaboration with southern African cultural organizations and institutions, while taking the next step in a formal collaboration with the Livingstone Museum. During the trip, Wisnicki and McDonald also had the opportunity for extensive discussions about One More Voice, a new Livingstone Online initiative, that seeks to recover nineteenth-century narratives of travel and other relevant contributions by non-western populations and individuals to the written record of British travel in Africa. 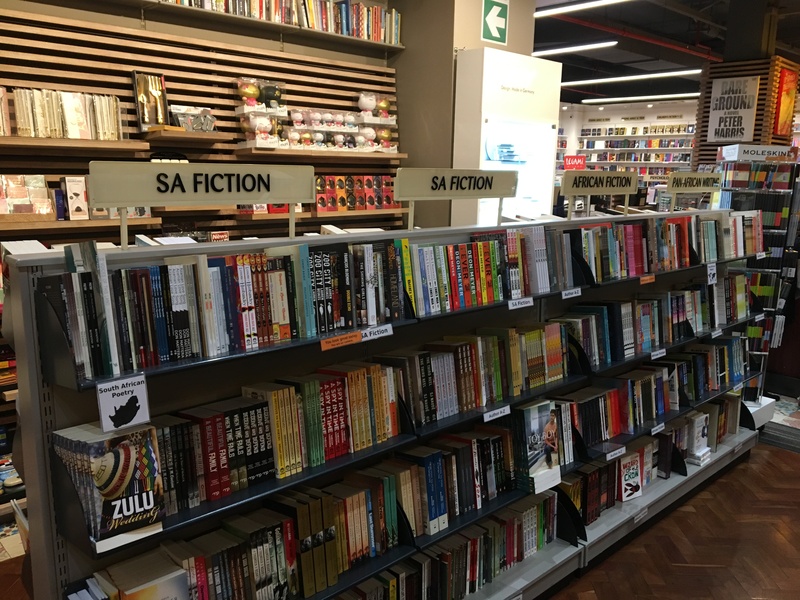 The South African, African, and Pan-African fiction sections at an Exclusive Books in Johannesburg. Exclusive Books is a chain comparable to Barnes and Noble. The initial stay in Johannesburg created an opportunity to browse new regional, continental, and diasporic African fiction. Although the books shown here are but a sampling of recent African literary production, bookstores in the US rarely display such literature in an integrated fashion. Copyright Adrian S. Wisnicki. CC BY-NC 3.0.